SAP B1 is the favorite ERP for many SMEs across industries and this is true for the e-commerce industry. SAP B1 is an industry favorite for many reasons. 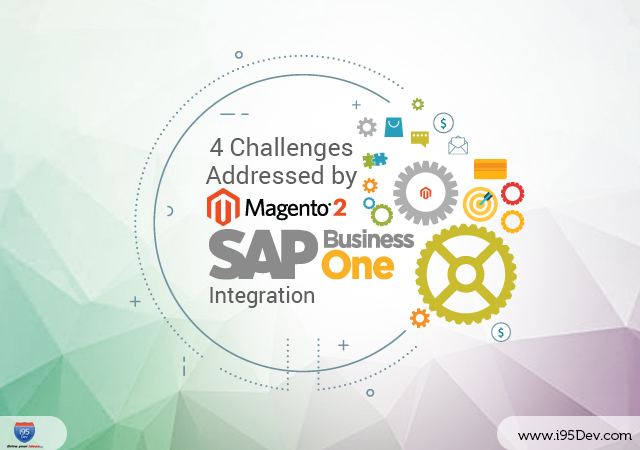 However, we focus on specific challenges addressed by Magento SAP B1 integration. What better place to start than to look at why SAP B1 is a champion of SME market. Magento 2 and SAP B1 are two strong platforms in their own forte. While it is easy to appreciate the benefits of bringing them together, let us look at a few challenges it solves. Customer information is vital for e-commerce business. The sheer volume and fluid nature of the data make it very important to maintain a clear management process. Information such as contact details, payment, order history, order status, and past preferences are vital to the business. Most e-commerce companies understand neither the complexity nor the nitty-gritty of the process. As a result, they end up burning through their resources just to stay afloat. Such a process tends to give way to many human errors and resultant in revenue loss. What can i95Dev Magento SAP B1 integration solve? A robust and agile integration setup is must to address this challenge. Consider this, most of your customers are regulars. However, as a growing online store, many first time buyers frequent your website. Forcing them to create an account before making a purchase might act as a deterrent. A guest login feature helps to overcome this barrier. Your integration platform must be flexible enough to handle this feature. For example, i95Dev’s Magento SAP B1 Connect allows you to build any number of custom workflows to address your future requirements. Imagine the time and effort you save by automating the entire data flow from Magento to SAP B1. Apart from saving time, errors introduced by manual intervention come down. Let us consider the payment information of clients. The client provides them with one sales channel and expects the information to reflect on all the channels. This is industry standard for an omnichannel experience. In addition, you might want to offer a personalized discount based on certain parameters. An effective integration platform can aid in sustainable growth as it supports many customizations like the ones mentioned above. Bi-directional synchronization of their customer order details. For a growing online store, ten or twenty-time growth a year is not unheard of. In such a scenario, you can quickly grow from tens of orders a day to several hundred an hour. Most online stores are caught off guard during this phase, and the first sign of it is order management going haywire. These stores try to accommodate hundreds of order when they can barely manage a fraction of it. Issues like missing orders, overselling, underselling, and information gap amongst sales channels become evident. It gets worse when the online store also sells through third-party marketplaces like Amazon and eBay. What does the i95Dev Magento SAP B1 integration solve? A robust and flexible platform helps manage the data flow between Magento and SAP B1. Platforms like i95Dev’s Magento SAP B1 Connect allows you to build a scalable business process. Such a platform manages issues similar to the ones discussed above are seamless while offering freedom to get creative with your business process. It is quite common for an online store to diversify into sales channels to increase sales. Online marketplaces like Amazon, eBay and reverb tend to reward punctuality and quality. However, when an online store starts selling on marketplaces, it creates a complex network of disconnected systems. These systems consist of an inventory management system, Magento and multiple online stores including marketplaces. It is very easy to see how such a system can lead to issues like under-selling and over-selling. Unlike a brick and mortar store, an online store stays open 24/7. To manage the inventory levels across the channels around the clock is virtually impossible. The best practice is to treat SAP B1 as the master of all the information. Hence, SAP B1 is always up to date with any changes in the inventory, sales, logistics, warehouse capacity, etc. An integration platform like i95Dev’s Magento SAP B1 Connect leverages on this practice to make sure a sale is foolproof. It avoids scenarios like over-selling or under-selling. Additionally, online stores can customize the workflow to suit their process needs. In a connected eco-system, replenishment of stock and disposal of stock through offers is possible. The platform can manage the workflow based on custom requirements. This can reflect on the reduced loss of sales and warehousing costs. Right pricing is critical for sale. Many factors influence the pricing of a product at any given time. However, online stores must maintain specific pricing across sales channels. As the product catalog and sales channels grow, maintaining ERP and Magento in silos creates challenges. The inefficient process leads to lack of responsive pricing, which can, in turn, lead to direct loss due to low pricing or loss of sale due to high pricing. Some online stores have a channel specific pricing. Managing such a requirement without an integration between ERP and Magento is virtually impossible. Magento is generally the master of all the pricing information. Online store owner can use Magento to create a tier based pricing model. Stores can leverage on this feature to manage pricing strategies like timed offers, channel-based pricing, discount coupons and more. However, for the same information to translate into orders, updating SAP is vital. The store can effectively offer such discounts with help of an integration platform like i95Dev’s Magento SAP B1 Connect. The information from Magento is mapped and updated on SAP on the need basis. This allows the e-commerce manager to offer discounts without blindsiding the operations team. Given the sensitive nature of pricing, this flexibility opens up a whole lot of possibilities for an online store. Our expertise comes from helping many online store owners scale the heights with our product. Our expertise is industry and geography agnostic. Our expertise also extends to other ERPs like Microsoft Dynamics and Sage. For more information on how we can provide custom solutions to help you, contact us at info@i95dev.com.